If it’s a Sandals- RIU showdown, let’s play fair! The big boys over at the Jamaica Observer have something to crow about. 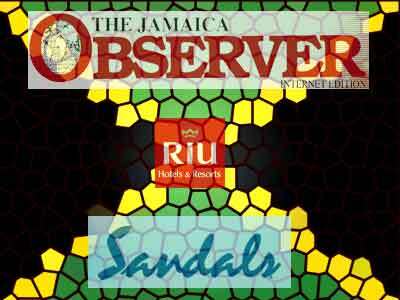 The Observer, under the same ownership as the rival Sandal’s resorts, has been relentless in pursuing the probe into the building operations of Spanish hotel investment group, RIU. It is evident their effort is finally beginning to pay off. The tabloid has repeatedly lambasted RIU for contravening building codes by adding an extra floor to a building considered to be in the flight path of aircraft descending into the nearby Sangster International Airport. The public deserves to be informed on the real issues concerning the RIU debacle. With the barrage of criticisms being levelled at RIU and its breach of building codes, the tabloid has been strident in its calls for the penalization of the Spanish hotel group, and while the newspaper itself has not enunciated the severity of the penalties, it has published opinions of contributors and letters to its editor from outraged citizens and angry envronmentalists calling for the demolition of the buildings in breach on the Mahoe Bay site, pushing RIU behind a wall of silence, with only a feeble denial of the charges as their defence. Now the construction site has reportedly been placed in lock-down mode until investigations are complete. RIU must be losing millions from this punishment, and their competition celebrating victory in this first round. The outcries have allegedly prompted decisions by other Spanish hotel concerns to shelve plans for investing in Jamaica and to increase the hotel room inventory on the island. One such concern, the Excellence Group, is reported by the Gleaner to be recalling its expatriate employees and cancelling orders from purveyors, in spite of plans on the drawing board for a project which would have provided employment for about 3,000 locals, and pumped more than US$400 million into the economy. This report has been stoutly denied by the Tourism Minister Ed Bartlett. The coup de grace appeared to be the inclusion of government officials to the barrage of criticism, and not just the Minister of Local Government either, whose involvement would have sufficed, but none less than the Prime Minister himself castigated RIU, even before the requisite investigations were conducted and a report produced. Turns out it might have been an inside job, but the alleged facillitator and signator of the approved building contract has kept mum on the subject. With the cessation of further construction on the site, who wins? How does Jamaica stand to benefit from the pyrrhic victory of one of the industry’s rivals? But there seems to be more than contravention of building codes behind this showdown. Few seem to notice that the Observer, owned by local hotel magnate Butch Stewart, has been the vehicle used to punish his competition. Is that playing fair? Is there any substance to the rumor that the Sandals resort located on the adjoining property to the RIU Mahoe Bay building site is threatened sitting in the shadow of the newer, more handsomely appointed and God forbid, less expensive facility? Sandals has a well-deserved reputation for making inroads into the promotion of Jamaica as an attractive destination, not just in the US but globally, but is the chain just averse to any competition, and will all other potential resort concerns challenging its sovreignty be in like manner cut down to size? The “rules” have never seemed to hold sway in Jamaica; local companies set the stage for the foreigners, who study not just the law, but the lay of the land in doing due dilligence prior to making decisions to conduct business on the island, using the “monkey see, monkey do” principle. As the plot thickens, what is indeed lacking is an unbiased report of RIU’s activities, clarification concerning public officials involved in the procurement of the building permits and a timely resolution to the prevailing impasse. And while there is every need to protect Jamaica’s environmental interests and ensure the strict adherence to building codes, no one can deny the real agenda of the Observer, which is being seen increasingly as a powerful public relations arm of the Butch Stewart-led Sandals Resorts group, intent on stemming the tidal wave of Spanish owned resorts beaching on the island’s shores. And in the absence of a well-researched and balanced approach by any of the two leading dailies to present the facts to a concerned public, the inevitable was bound to happen. Questions are now being asked and accusations being hurled against Sandals, regarding the company’s own record pertaining to environmental matters and building codes in the past. The Golding government cannot afford to drag its feet on this issue. As Jamaica’s tourism product languishes in mediocrity vis a vis the potential the island holds, the administration must in a timely fashion conduct and complete its investigations, applying the penalties that attend their outcome, to both perpetrators and facilitators. The newspapers need to abandon their tribalistic approach, eschew their garrisoned reportage and provide some unseasoned and in-depth analysis. Surely it can’t be all about humiliating the competitor, for that signifies a zero-sum approach. The future of Jamaica’s allure for foreign investors rests on a fair and swift resolution to this matter. The current path is suicidal to the industry’s hopes.